At an estimated $335.17 billion, total charitable giving from U.S. individuals, corporations, foundations and bequests in 2013 approached the peak seen before the worst of the Great Recession, adjusted for inflation, according to research released today by Giving USA Foundation and its research partner, the Indiana University Lilly Family School of Philanthropy. When measured in current dollars, 2013 marked the fourth straight year of increased giving. As reported in Giving USA 2014: The Annual Report on Philanthropy for the Year 2013, total giving has increased 22.0 percent since the official end of the recession in 2009 (12.3 percent when adjusted for inflation). Donations in 2013 increased 4.4 percent (in current dollars) from the revised estimate of $320.97 billion for 2012. Adjusted for inflation, total giving rose 3.0 percent over the 2012 estimate. Giving by individuals in 2013 was bolstered by the economic gains many households have experienced in the last two years, driven by persistent—albeit moderate—increases in personal income, personal consumption expenditures and personal disposable income. The Standard & Poor’s 500 Index (S&P 500), which impacts the financial outlook of wealthier donors more than the finances of others, rose significantly in 2013 over 2012 and likely catalyzed giving by these donors. David H. King, CFRE, president of Atlanta-based consulting firm Alexander Haas and chair of The Giving Institute, the trade association that created Giving USA and its foundation, noted that while total giving in 2013 was the highest seen in the post-Great Recession era and individual giving is gaining strength, all types of organizations are not participating equally in this recovery—possibly reflecting the rates at which donors of different types are recovering financially. Over the past five years, giving by corporations has risen much faster than overall giving, at 19.4 percent compared with 12.3 percent (adjusted for inflation). In 2012, corporate giving grew rapidly at 16.9 percent (in current dollars), driven by soaring corporate profits that year. The 2012 jump in corporate giving also helps explain why 2013 corporate giving appears subdued. Although corporate giving decreased in 2013, the year saw considerable growth in very large gifts of $80 million and up from individuals, couples and estates. “We witnessed a number of these very large gifts from households and estates, which may be signaling growing confidence among wealthy donors in making larger commitments,” said Gene Tempel, Ed.D., CFRE, founding dean of the Indiana University Lilly Family School of Philanthropy. “In several examples, the resurgence of high-dollar capital campaigns, including those with billion-dollar goals at the largest nonprofits, suggests that the confidence organizations have in the giving environment is growing as well,” Tempel said. Rising confidence and sustained increases in overall charitable giving raise the possibility that giving could recover to prior high levels earlier than anticipated. “The growth in giving over the past two years suggests that a return to the peak level of total giving we saw prior to the recession could occur sooner rather than later, if recent growth rates in giving continue,” said Patrick M. Rooney, Ph.D., associate dean for academic affairs and research at the Indiana University Lilly Family School of Philanthropy. When adjusted for inflation, 2007 donations totaled an estimated $349.50 billion. Rooney cautioned, however, that there are caveats to the possibility of a near-term recovery in total giving reaching the 2007 level. “The instability of some areas of the economy, such as unemployment and corporate profits, as well as the volatility of the S&P 500, could weaken overall gains in giving in the future,” he said. The single largest contributor to the increase in total charitable giving in 2013, over 2012, was an increase of $9.69 billion in giving by individuals (in current dollars). Giving increased for three of the four sources of giving. Only giving by corporations declined slightly in 2013, the result of the slow rate of growth in pre-tax corporate profits in 2013, at 3.4 percent. Total giving was given a lift by several very large gifts made by individuals, couples and estates in 2013. Giving by individuals increased 4.2 percent (2.7 percent adjusted for inflation) from the revised estimate of $230.91 billion in 2012. Giving by corporations decreased 1.9 percent (-3.2 percent adjusted for inflation) from the revised estimate of $18.22 billion in 2012. Giving by foundations increased 5.7 percent (4.2 percent adjusted for inflation) from the revised estimate of $46.34 billion in 2012. Giving by bequest increased 8.7 percent (7.2 percent adjusted for inflation) from the revised estimate of $25.50 billion in 2012. Most subsectors (types) of charities saw increases in giving in 2013 compared with 2012. Five subsectors have reached or surpassed their all-time-high giving levels (in inflation adjusted dollars) since the recession officially ended in mid-2009: education, human services, health, foundations and environment/animals. Giving to foundations, which tends to be volatile from year to year due to the very large gifts foundations receive, fell 15.5 percent in 2013. Giving to international affairs has become more volatile in recent years and showed a decline of 6.7 percent, which could be attributable partially to lower overall corporate support for charities in 2013. Other factors affecting giving to international affairs may have included lower levels of support to U.S.-based nonprofits providing international disaster relief. Some donors are choosing to give directly to overseas organizations working in that arena. More specifically, Osili said that “people are giving to education, including higher education and K-12 institutions at record levels, across the board. Also, campaigns that appeal to different generations are doing very well. We have seen sustained levels in giving to health in support of hospitals, medical research and even health policy initiatives, as well as a growing number of gifts in support of environmental protection. Giving to religion was flat (-0.2 percent) between 2012 and 2013, with an estimated $105.53 billion in contributions. Inflation-adjusted giving to the religion subsector declined 1.6 percent. Giving to education is estimated to have increased 8.9 percent between 2012 and 2013, to $52.07 billion. Adjusted for inflation, giving to education organizations increased 7.4 percent. $41.51 billion. Adjusted for inflation, giving to human services organizations increased by 0.7 percent. Giving to foundations is estimated to have declined by 15.5 percent in 2013, to $35.74 billion. Adjusted for inflation, giving to foundations declined 16.7 percent. Giving to health organizations is estimated to have increased 6.0 percent between 2012 and 2013 (an increase of 4.5 percent, adjusted for inflation), to $31.86 billion. Giving to public-society benefit organizations increased by an estimated 8.5 percent between 2012 and 2013, to $23.89 billion. Adjusted for inflation, giving to public-society benefit organizations grew 7.0 percent. Giving to arts, culture, and humanities is estimated to have increased 7.8 percent between 2012 and 2013, to $16.66 billion. Adjusted for inflation, giving to the arts, culture, and humanities subsector increased 6.3 percent. Giving to international affairs is estimated to be $14.93 billion in 2013, a decrease of 6.7 percent from 2012. Adjusted for inflation, giving to international affairs organizations declined by 8.0 percent. Giving to environmental and animal organizations is estimated to have increased 7.5 percent between 2012 and 2013, to $9.72 billion. Adjusted for inflation, donations to the environment/animals subsector increased 6.0 percent. Giving to individuals is estimated to have risen 1.4 percent between 2012 and 2013, to $3.7 billion. The bulk of these donations are in-kind gifts of medications to patients in need, made through the Patient Assistance Programs of pharmaceutical companies’ operating foundations. Unallocated giving was negative $0.44 billion in 2013. This amount can be considered as the difference between giving by source and by use in any particular year. This amount includes the difference between itemized deductions by individuals (and households) carried over from previous years. The tax year in which a gift is claimed by the donor (carried over) and the year when the recipient organization reports it as revenue (the year in which it is received) may be different. The Indiana University Lilly Family School of Philanthropy prepares all of the estimates in Giving USA for Giving USA Foundation. Giving USA develops estimates for giving by each type of donor (sources) and for recipient organizations categorized by subsectors (uses). Most of Giving USA’s annual estimates are based on econometric analyses and tabulations of tax data, economic indicators, and demographics. Sources of the data used in the estimates include the Internal Revenue Service (IRS), Bureau of Economic Analysis (BEA), the Philanthropy Panel Study (PPS), Council for Aid to Education (CAE), the Evangelical Council for Financial Accountability (ECFA), the Urban Institute’s National Center for Charitable Statistics (NCCS), U.S. Census Bureau, and others. Estimates for giving by foundations are provided by the Foundation Center. The methods for estimating giving to religious organizations and foundations are not based on econometric models. Econometric models cannot capture giving related to anomalous events, like natural and man-made disasters, or very large gifts called “mega-gifts.” In these instances, Giving USA adds additional estimates for contributions given by donor type or to particular subsectors. The Giving USA estimate for giving by itemizing individuals (and households) is based on a projection that incorporates historical trends in itemized giving and changes in economic variables related to personal income and wealth. To estimate non-itemized charitable giving by individuals through 2013, Giving USA used the latest dataset available from the Philanthropy Panel Study (PPS) series, which is part of a longitudinal study of about 9,000 households who are asked, among other questions, about their charitable giving behaviors every other year. The method for estimating contributions by bequest in 2013 includes two primary components: an estimate for bequests made by estates with assets $1 million or more and an estimate for estates with assets below $1 million. This procedure uses data collected by the Council for Aid to Education (CAE) about bequests received at institutions of higher education, as well as data from the IRS on filed estates and governmental demographic data. Giving by foundations data are provided to Giving USA by the Foundation Center for giving by independent, community, and operating foundations in 2012. The Foundation Center also provides estimates for giving by corporate foundations. That component is moved from the Foundation Center’s estimate of giving by all types of foundations and calculated in the Giving USA estimate for giving by corporations. Go to www.foundationcenter.org for more information about the Foundation Center’s estimates for giving by foundations in 2013 and prior years. The estimate for giving by corporations in 2013 is based on the most recent data available for itemized contributions claimed by companies on federal tax returns for years 2011 and prior. Giving USA relies on data provided by other research organizations for components of the estimates for giving by type of recipient, which include organizations in the religion; education; human services; health; arts, culture, and humanities; environment/animals; public-society benefit; and international affairs subsectors, as well as for giving to foundations. For estimating charitable contributions to all recipient subsectors other than religion and foundations, Giving USA relies upon data provided by the Urban Institute’s National Center for Charitable Statistics (NCCS). This dataset tabulates charitable contributions made to nonprofit organizations within each subsector. The data are based on organizations’ Forms 990 and 990-EZ. A percentage change in giving to religious organizations developed by collecting amounts given to congregations and other types of religious organizations as reported by mem¬bers of the Evangelical Council for Financial Accountability (ECFA). For more specific details on Giving USA’s methodology section, please the “Brief summary of methods” section within the Giving USA Annual Report or contact the Indiana University Lilly Family School of Philanthropy at adrldavi@iupui.edu or 317-278-8972. On request from media, data for 1973 through 2013 are available that show sources of contributions by year in current and inflation-adjusted dollars and allocation of gifts by type of recipient organization, also in current and inflation-adjusted dollars. Data also are available showing total giving as a percentage of gross domestic product, individual giving as a percentage of disposable income and corporate giving as a percentage of corporate pre-tax profits. The requested citation components for Giving USA include: Giving USA 2014: The Annual Report on Philanthropy for the Year 2013, a publication of Giving USA Foundation, 2014, researched and written by the Indiana University Lilly Family School of Philanthropy. Available at www.givingUSAreports.org. Advancing the research, education and public understanding of philanthropy is the mission of Giving USA Foundation, founded in 1985 by The Giving Institute. Headquartered in Chicago, the Foundation publishes data and trends about charitable giving through its seminal publication, Giving USA, and quarterly reports on topics related to philanthropy. Visit www.givingusa.org for more information. Giving USA: The Annual Report on Philanthropy is published by Giving USA Foundation and is a public service initiative of The Giving Institute. 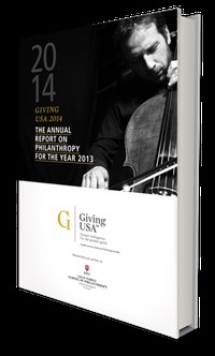 Giving USA is the longest running, most comprehensive report on philanthropy in America. For more information, visit www.givingUSAreports.org. The complete Giving USA 2014 report, with estimates covering 2013 giving, will be available at www.givingUSAreports.org on June 17, 2014. Giving USA Highlights, a complimentary executive summary with key findings, also will be available, thanks to support from donors and sponsors. Options for purchase include the full report with 30+ charts and explanatory text, plus chapters on sources and uses of contributions, as well as PowerPoint presentations based on the charts in the report. Giving USA Foundation also publishes Giving USA Spotlights, which are short reports on charitable giving and fundraising trends and are researched and written by the Indiana University Lilly Family School of Philanthropy. Each issue provides in-depth analysis on a specific topic related to charitable giving and fundraising in the United States.